On November 18, 2013 when I started to write about what happened to ancient seas on Mars an Atlas 5 rocket sat poised a few miles north of my condominium in Cape Canaveral, ready to blast off for the Red Planet. It carried MAVEN, with MAVEN standing for Mars Atmosphere and Volatile EvolutioN. Its mission was/is to determine how the Martian atmosphere (i.e. atmospheric pressure) and water (ocean) were lost over time. On Figure 1 below, the axis term is MARS MAVEN. At an ELS on the matrix is ATMOSPHERE and VOLATILE. PRESSURE is at the same absolute skip as MARS MAVEN. In the open text is LET THE WATERS BE GATHERED FROM UNDER THE HEAVENS TO ONE PLACE AND LET APPEAR THE DRY (LAND). On November 22, 2016 we learned that the Code was right, with waters having gathered on Mars at Utopia Planitia to an area the size of the State of New Mexico, with a volume of water equal to what is in our Arctic Ocean. The sea has a frozen surface covered with 3 to 33 feet of soil. Note: Figure 2 below shows that Utopia Planitia, Mars is encoded along with what likely caused most seas on Mars to dry up or freeze. Figure 1 above shows the matrix based on Mars MAVEN as an axis term. Prior to this announcement we learned that there is, in fact, running water on the surface on Mars at many places. The sites are discussed on my article about running water. The water is seen appearing on the slopes of crater walls, possibly coming out of the ground although NASA argues for deliquescence. In it perchlorate salts like those found on Mars have a special capability of being able to absorb moisture until they dissolve in the moisture absorbed and form a solution. Deliquescence occurs when the vapor pressure of the solution that is formed is less than the partial pressure of water vapor in the air. Of course for deliquescence to occur there has to be enough water vapor in air to start the process. Figure 2 below shows the encoding of UTOPIA with PLANITIA and FROM MARS as well as an open text possible cause for the loss of Martan opens. Below: Spreadsheet showing the statistical significance of Figure 2. STATISTICAL SIGNIFICANCE OF FIGURE 1. As per my standard protocol, no statistical significance is assigned to the axis term, here the only ELS of the longest and best spelling for MARS MAVEN. The three a-priori key words did not have very high statistical significance but the verse found in the open text did and it was the inspiration for this article. However, the statistical question was where to cut off the open text presentation. The section LET THE WATERS BE GATHERED FROM UNDER THE HEAVENS TO ONE PLACE AND LET APPEAR THE DRY (LAND) includes a number of important Mars-related items. It deals with water, where it is gathered to, the fact that it is under the heavens (or sky), and that dry land (like the planet Mars) would appear after that. To show all this and other key words requres 39 columns and a matrix 1,014 letters in area. If I just include everything up to ONE PLACE then we only need 29 columns and 754 letters. While this cuts off AND LET APPEAR THE DRY (LAND), it points well enough to the water issues in this article, so I made the cut there. As such, the odds against LET THE WATERS BE GATHERED FROM UNDER THE HEAVENS TO ONE PLACE appearing so close to MARS MAVEN were about 404 to 1. The next most significant term was PRESSURE at a special case skip (here the absolute skip of the axis term). That match was found against odds of about 13 to 1. ATMOSPHERE and VOLATILE were each more likely to appear at an ELS than calling a coin toss correctly. Overall, the matrix appears against odds of about 15,351 to 1. STATISTICAL, POLITICAL AND SCIENTIFIC SIGNIFICANCE OF FIGURE 2. Again, as per my standard protocol, no statistical significance is assigned to the axis term, here the only ELS of UTOPIA (7 letters in Hebrew) that matches up with the 7-letter a priori key word PLANITIA (at one skip more than that of the axis term). Only 21 rows and 12 columns (252 letters) are required to see the match. If this 756-letter matrix were based on the lowest skip of UTOPIA , then the odds against the match being somewhere on the matrix would be about 403 to 1, and the odds against it being in a 252-letter box would be about 1,210 to 1. However, the finding of UTOPIA here at skip -149,530 is actually at the highest skip for the word in wrapped Torah, with an ELS rank of 85 which generally means that the match isn't significant unless it can be paired with other very meaningful information. However this matrix does indeed offer other very meaningful (a priori) information. When I have an axis term not at the minimum skip at the end of the statistics calculation I divide the significance by the ELS Rank. So if I only had a match of UTOPIA with PLANITIA I would divide odds of 403 to 1 by 85 and say that the odds against having such a match by the 85th ELS of UTOPIA are just about 4.75 to 1. Or, since we are only talking about the two terms here in 252 letter and not the full 756-letter matrix, I would divide 1,210 to 1 by 85 and arrive at a figure of about 14.2 to 1. So how do the extra terms affect the odds, and what does this matrix show us that is consistent with what we learned from the Mars MAVEN matrix? The next term to look for is obviously MARS. There is a 3-letter ELS of it (at one skip less than that of the axis term). Odds against it being on the 756-letter matrix were about 2.39 to 1. That's not spectacular, but what makes this matrix significant is what is found in the open text: HE SHUT UP THE HEAVEN SO THAT THERE WILL BE NO RAIN. Although the Mars Phoenix lander detected snow falling, no lander has yet seen rain falling. We're not sure it's accurate, but in the first 1,545 sols (Martian days) of Mars Science Laboratory (MSL) operation reported, not a single sol has had the opacity listed as anything but "sunny." So the description of having the heaven shut up so that there will be no rain seems spot on. The odds against this phrase being on the matrix were about 403 to 1. Now, when value of all the terms mentioned so far are combined and then divided by 85, the odds against the matrix existing by chance are seen to be 4,482 to 1. This is the figure that best described the value of the matrix, but there is one more a priori term that needs to be discussed. There is an open text finding of THE ALIEN. Yes, the term was found a priori, but it's not at all certain that aliens had anything to do with why Mars lost most of its oceans. Certainly Mars would have maintained a more stable climate if it had a large moon like the Earth does which minimizes the change in tilt of our axis. Mars has only two small moons. While the current tilt of the Martian axis (25.19 degrees) is close to what we have here on Earth (23.44 degrees), the Martian axis wobbles a lot and this can double the tilt in as little a geologic time as 120,000 years. That can have a massive impact on frozen vs. liquid seas. Could an alien power ever have done anything to alter Martian climate or axial tilt by destroying an ancient Martian moon? I have no direct evidence for anything like that although lunar astronaut Buzz Aldrin stated on C-SPAN on July 25, 2009 that there is a Monolith on Phobos, a moon of Mars. Click here to hear Buzz Aldrin's speech. There seems to be some Kremlin interest in the claim by Dr. John Brandenburg that I write about where he asserts there were nuclear detonations in the ancient Martian past. Kremlin IP addresses that have read our articles on this topic are 66.102.9.7, 81.90.2.154, 93.81.83.196, 128.69.205.66, 176.195.117.152, 176.192.142.134 and 188.32.227.41. As of December 14, 2016 there are few (but some) such hits by NASA-related IP addresses (Ames, the designer of the pressure sensor for Phoenix and MSL, plus DoD friends), but up through 12/14/2016 there were at least 32 such hits by Kremlin IP addresses. So while the American side expresses curiosity about Brandenburg’s ideas (dramatized on the TV show Ancient Aliens), the Russians seem to be more fixated on it. I went looking for a link to his appearance on Ancient Aliens to supply here, but first found a link to a 6 minute 40 second video at https://www.youtube.com/watch?v=0Ya-7_rEqYM. To my near shock, at 5 minutes 40 seconds onto the film I found my Torah Codes matrix matching ATOMIC HOLOCAUST with MARS, along with part of my probability spreadsheet. There was no credit for me, but I think that most people who search for Brandenburg will eventually come to what I wrote about him. Let me cut to the chase here. The video just referred to shows that one of the two areas Brandenburg associates with a nuclear war on Mars was at the eastern side of Utopia Planitia (at Galaxia Chaos which is situated in a highly complex region in the transition zone between Elysium Rise to the south, Utopia Basin to the north, and is bounded by Hecates Tholus to the east and by Elysium/Utopia flows to the west - See Figure 3). If Brandenburg is right, then ALIEN is a valid search term. Odds against its appearance at skip +1 were about 40.8 to 1. This alters the odds against Figure 2 from about 4,482 to 1 up to about 182,293 to 1. A WORD ABOUT WHO WROTE THE CODE AND WHY I MAY BE ABLE TO READ IT. When I was interviewed about the Code by the History Channel in 2004 I was asked about its source. From 2:59 to 3:50 of Part 3 I discuss ideas about who wrote the Code. My belief is that it's God. Drosnin's book forwarded the idea of alien's or a time traveler from the future. However, the remarks that I originally made about finding enough personal names should be updated with the information that I posted at Talmud & Names. Not everyone will find their name in the Code. One of my greatest sources of information is far from mysterious. MySite.com which hosts my sites offers the ability to show which IP addresses have read each article. I don't look up everyone, but I do look at the IP addresses of readers who have a .mil address (U.S. military), a .gov address with an emphasis on NASA or a .ru from Russia. I will catch the Chinese if they are on Marscorrect.com or Davidaroffman.com, but I don't look for them on Arkcode.com, although based on recent events I probably should. Only recently have I become aware that NASA and other space agencies have an interest in what I write about the Torah Code. And with this observation I wonder if they think that I can read what may be an alien language or Code because I am an alien. So let me be clear. I'm not. IF I can read such a language it's only because I've spent 19 years of hard research trying to decipher the Code. I still don't have the primary proof that I need to say, "Yes, this is a Code." What proof have I always demanded to make such a claim? Based on multiple ELS maps that I have found and posted, I would require that the Ark of the Covenant be found in less than a half nautical mile from 31 degrees 9 minutes North, 33 degrees 4 minutes East on the El Zuqba Peninsula jutting into Lake Bardawil in the northern Sinai of Egypt. Nor, despite his own verification of the math that I use for statistical analyses of Torah Code matrices, has David yet accepted the reality of the Torah Code. So, in this article, I will show what happens when the axis term TACHYON TIME is combined with the shortest transliteration of our family’s last name, ROFFMAN. This doesn’t mean that either the Torah Code or tachyons are currently proven. Rather, the article is a challenge my son to find out if tachyons are indeed part of the solution for what he seeks – the physical and mathematical rules for Creation. Should he indeed find the answer one day, then this article will serve as a reminder that God made tachyons and He foresaw their discovery first. Note: A September 2011 report about tachyonic neutrinos was proven incorrect. So now, at the age of 23, David has his PhD in physics, and he is doing a postdoc at Yale Medical School in the area of medical physics. Like Michael Drosnin, author of the book The Bible Code (poorly written from a scientific perspective) that motivated my initial Bible Codes studies with a goal of seeking information that would be useful to U.S. intelligence agencies, David believes that the Code is real, but created by aliens. I'm sure that I have complicated his search for a Government job by challenging NASA as much as I have, but I hope that after Elon Musk (Mars fanatic and SpaceX owner) met with President-Elect Trump on December 14, 2016, David will eventually return to space physics to help us land people on Mars. Alright. That's enough of a diversion from the topic of the frozen sea at Utopia Planitia. So let's return to that topic. Figure 3 below shows a closep map of Utopia Planitia where the water ice was found. Figure 4 below shows where Utopia Planitia is with respect to the bulk of the rest of Mars (excluding the poles). 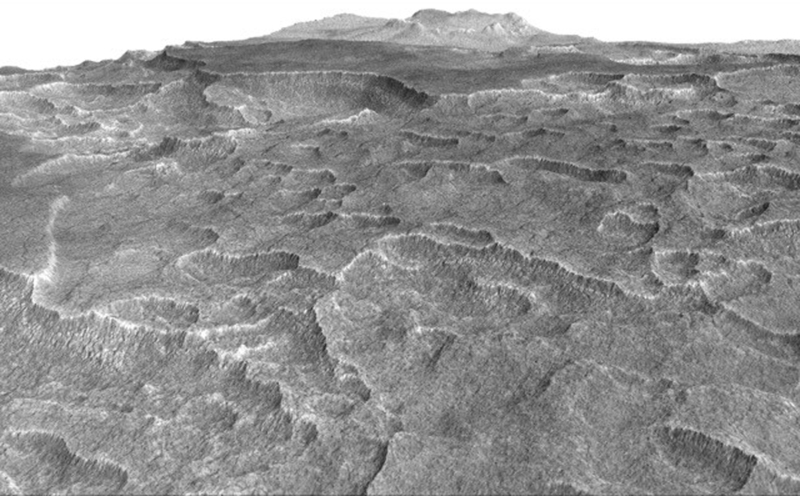 The rest of this article will repeat, enhance, and comment on the NASA article at https://www.nasa.gov/feature/jpl/mars-ice-deposit-holds-as-much-water-as-lake-superior. Our comments will be in blue bold fonts. Figure 6 below - See the original caption under the image. At the latitude of this deposit -- about halfway from the equator to the pole -- water ice cannot persist on the surface of Mars today. It sublimes into water vapor in the planet's thin, dry atmosphere. Our Comment: The NASA/JPL comment shown on Figures 2 above refers to "seasonal water-ice ground frost on Mars." The date of the Viking 2 photo insert there (complete with a false sky color) is May 18, 1979. That was at Ls 288.7 (early winter which began at Ls 270 in the northern hemisphere). Figure 7 - Extract from The Viking 2 weather data to show morning weather on May 18, 1979. Note the low temperatures of -166.7 F, and -110.39 C which is 162.76 K.
THE NASA ARTICLE CONTINUES: The Utopia deposit is shielded from the atmosphere by a soil covering estimated to be about 3 to 33 feet (1 to 10 meters) thick. Our Comment: A soil covering of only 3 feet seems to be very thin when it comes to stopping sublimation. Clarification is needed with respect to how often the soil is this thin vs. how often it's up to 33 feet. The statement about the planet's thin, dry atmosphere leaves out a specific pressure, and our report entitled Mars Correct: Critique of all NASA Mars Weather Data disputes the low pressure that NASA asserts at areoid, however as is seen in Figures 3 and 4 Utopia Planitia is considerably below areoid (in fact, about 7 km below areoid as is shown on Figure 3) meaning that even by NASA standards the pressure will be sufficiently above the triple point (the point at which the temperature and pressure at which the three phases (gas, liquid, and solid) of that substance coexist in thermodynamic equilibrium - for water 273.16 K, 6.11657 mbar) thus enabling both ice and liquid water (when warm enough) to exist at the surface (as it does in conjunction with recurring slope lineae at locations noted on Figure 4). Indeed if we accept the absurdly low NASA-backed pressure of 6.1 mbar at areoid, with a MOLA altitude of 7 km below areoid, as our calculation below reveals the pressure would be up to about 11.66 mbar in Utopia Planitia, but we present evidence in our report to back a real pressure of about 975 mbar. Note that in 2015 NASA Goddard put out an article and video about the ancient Martian ocean. Their article was entitled NASA Research Suggests Mars Once Had More Water Than Earth's Arctic Ocean. The accompanying video is at http://youtu.be/WH8kHncLZwM. Using ratios in waters of deuterium in water to normal hydrogen they determined that Mars had lost 87% of its water to space and that all that remained was frozen at the poles of Mars. However the new discovery obviously calls into question their conclusion. It begs the question of how much of frozen water is colored blue (which is only meant to mean low elevation) in the Northern hemisphere on Figure 2. Will we find frozen seas not just at Utopia Planitia, but also everywhere else in the northern hemisphere where altitudes at about 7 km below aeroid? The more ice that is found the more we can call into question the low pressures that NASA asserts to Mars. Figure 8 below - See the original caption under the image.